From the October 2015 Issue About twenty-five minutes into Times Square, the two leads break out of a mental institute, steal an ambulance, and take an abandoned warehouse as their new home. Few films have ever so gleefully thrust viewers into the cesspool that forms the setting of Times Square: the cheap neon red lights that dimly illuminate derelict strip clubs; sketchy streets enveloped in broken glass; Tim Curry’s teeth. But the film does not set out to exploit these settings or use them as the basis for some kind of Reefer Madness-esque morality play. It is instead presented as a patchwork of people of all kinds, from pimps, prostitutes and crackheads to seedy club owners to transvestite dancers. Furthermore, Times Square does not shy away from some of the more dubious aspects of its environment or romanticize any of the shady elements. It simply looks out at every character, from a bit player on the street to the central antagonists, with an empathetic eye. Giving Times Square a plot synopsis only does the film a disservice, but here’s one anyways: Pamela Pearl and Nicki Marotta, two teenage girls from the opposite sides of the social and class strata, meet in a mental institution. Nicki, the brash one who as far as we know doesn’t have a family, breaks out and convinces Pamela to join her. Pamela, being the daughter of a politician trying to “clean up” Times Square, ends up throwing her father’s campaign into disarray as he realizes he doesn’t really know his daughter at all. The two girls open up to each other and change for the better. 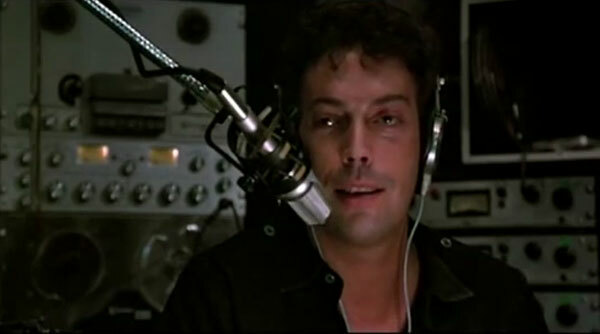 Tim Curry shows up now and then as a radio DJ, taunting Pamela’s father and praising the girls for their rebellious attitudes. This description makes the film sound like your generic John Hughes rip-off: just another story of two teenagers going out on their own to better understand themselves. It wouldn’t be wrong to classify Times Square as such, it would just be an oversimplification. The real heart of the film lies with the character of Nicki Marotta, played with the raspy wisdom of Robin Johnson, whose husky voice captures everything that is so special about Times Square: the vulgarity, the coarseness, but most of all, the acceptance. Nicki embodies punk (the ethos, not the music, although that too) more so than any other character I can think of. She busts a pimp’s car because she was told not to lean on it; pioneers a movement built around dropping TV’s from skyscrapers; and breaks into Tim Curry’s radio office and throws a phone through his glass divider. And while she is clearly struggling with complex internal issues of abandonment, she never manages to feel totally unhinged. In this sense, probably the most analogous fictional character to Nicki is Peter Pan—except instead of Disney, you get scuzzy Times Square and instead of Captain Hook, you get gentrification. It’s not until halfway through the film that you realize Times Square is in fact a musical. Not in the classic Gene Kelly/Judy Garland/Fred Astaire way, where characters break reality to sing and dance for you, but in the sense that through music—and specifically through punk music—Nicki and Pamela are able to express themselves in earnest. 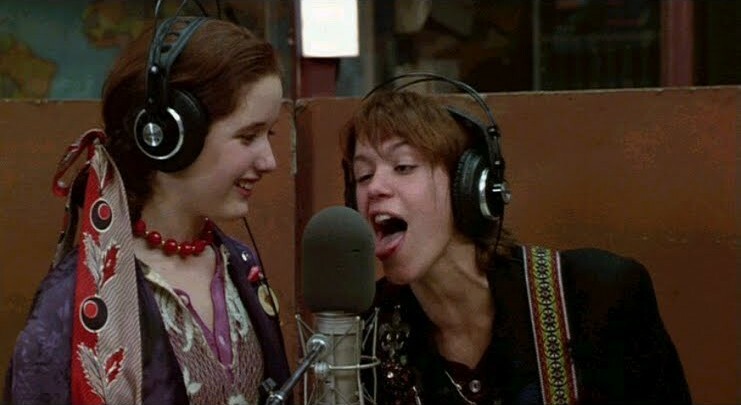 Nicki coerces Pamela out of the mental hospital by standing in the exit, holding a stereo blaring The Ramones’ “I Wanna Be Sedated.” The two communicate purely through expression, all of which is filtered by the song in the background. Later on, persuaded by Pamela to try, Nicki recites a poem she has written. Nicki’s personality is so infectious and charismatic that it can be easy to overlook her obvious self-destructive tendencies and the demons she hides in order to prop up the myth that is “Nicki Marotta.” But in this moment, we gaze at this hurt, self-loathing girl be honest in the only way she knows how. The poem is called “Damn Dog,” as in, “I’m a Damn Dog.” Pamela, proud of her best friend, can only say “It sounds like a song.” In the very next scene, we are introduced to Nicki’s band The Sleez Sisters, and through the band and her music, Nicki is finally able to turn her repressed feelings into art, into change, into revolution. It’s easy to see why: Nicki is essentially expressing the pent-up anxieties and fears that afflict all outsiders, using herself as a mirror to the countless many that feel the same way but lack an outlet to articulate it. Everything comes together at the end of the film, with Nicki and the Sleeze Sisters performing “Damn Dog” one last time in front of a crowd of the marginalized, of the left-behind. And we’re there too, watching this fucked-up woman share her fucked-up feelings about this fucked-up world, and it’s hard not to smile, tap your foot and wish you were there, swaying along with the crowd. Times Square is many things, but at its core it is a rallying call to the rejected and forgotten, to the ones who were left behind, who never fit in. Behind the grimy veneer of Times Square is a heart that beats truer than any John Hughes film. After all, we are all Damn Dogs, smashing TV’s, getting into trouble and singing the same song. Tags: Joel Kalow, October 2015. Bookmark the permalink.